In a world where third graders have cell phones and middle school students are striving to be “Insta-famous,” it’s no wonder teachers, and parents are noticing that students lack basic interpersonal skills needed to be successful in the real world. This is why more and more adults are actively looking for ways for young people in their lives to connect with others and improve their communication skills. America’s Finest Summer Camps is a great option for students not only to spend the summer having fun and trying new things but also provides a safe space for them to work on their interpersonal skills, meet new people and build relationships organically. Being successful at camp means being able to listen to rules and expectations, follow directions and adhere to a schedule. Campers have a lot of freedom to make their own choices, but there are times when their safety, health, and wellbeing are dependent on listening to counselors and staff. Counselors make it a point to ensure all campers feel heard and demonstrate active listening strategies when campers are talking. Eye contact, body language, and asking questions are all way counselors show campers they are listening, and campers follow their example. Campers are expected to listen to each other and avoid interruptions or distracting behaviors while fellow campers are talking. Learning to be a good listener will help campers be successful students during the school year and prepare them to be successful leaders as they enter the workforce. Good leaders can make important decisions in a short amount of time. They understand how to use all the information that they have, consider their past experiences, common sense, and intuition, and decide with confidence. Campers are given hundreds of chances over their sleep away camp experience to work in their decision-making skills. From which activities they want to try each day to what they want for lunch, campers are trusted to make healthy, safe and smart decisions to customize their camp experience. While camp will easily be the most fun campers will have all year, not every moment is rainbows and butterflies. Campers will face challenges during their time away from home, and it may be the first time they are charged with solving big problems without their parents by their side. Counselors are always on hand to guide campers through obstacles and challenges, but encourage campers to find solutions on their own. After a summer at camp, campers are equipped with problem-solving strategies to help them become more effective leaders. In a world where children and teens do most of their communication from their phones or computers, it’s no surprise that many are lacking opportunities to practice good ol’ fashion face-to-face communication. Since screen time is minimal at camp, campers spend most of their time talking and listening to others, developing things like self-awareness, empathy, patience, conflict management and listening. They learn to read cues given off by other campers, and how to be aware of the way they interact with others, both one-on-one and in a group setting. Camp helps campers bridge the gap when it comes to the critical interpersonal skills they need to be successful in life. And, as is most of the life skills that campers learn while they swim, fish, act, dance, hike, play, sing and explore, they usually have no idea they’re actually learning something. 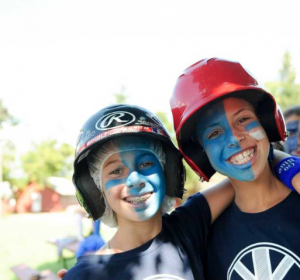 Every day, campers work on character building disguised as fun and leave camp more well-rounded than they came.